I’ve been eating a lot of quinoa salads ever since I did a guest post for Eating Rules. The post was about the amazingness of quinoa and how to make it the right way, as in not mushy. Andrew, of Eating Rules, posed a challenge to the world at large to give up processed food for one month, and somewhere around 3,000 people have accepted. Could you do it? Could you give up all processed foods for an entire month? You can start small, maybe one week, or maybe one meal per week for a month. How about “Unprocessed Wednesday Night Dinners” for the rest of the year. What is unprocessed? That been quite the discussion, for more information read this. But the short answer is, don’t eat food that has ingredients you don’t (or couldn’t) have in your kitchen. Skip the boxed, frozen, prepackaged, canned and chemical laden foods. Keep the journey from the farm to your table as short as possible. Cook with real, whole vegetables, fresh meats, grains that aren’t labeled “Instant” or “Success” or “Minute” but just: rice or quinoa. 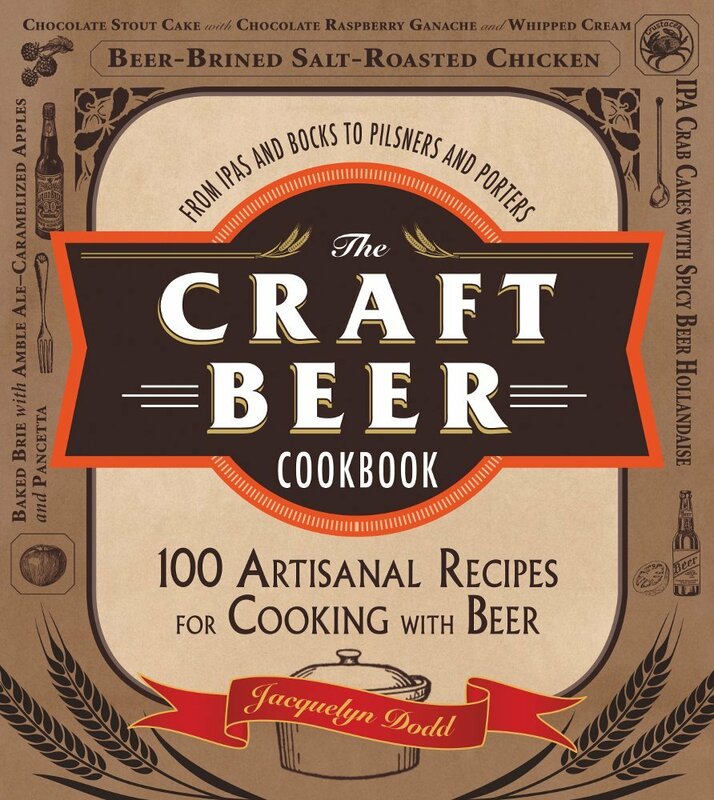 Make biscuits from scratch, roast a whole chicken, steam some vegetables, or grill some meat. You can do it. And the less processed foods your family eats, the healthier you’ll all be. For some inspiration to ditch the 37 ingredient bags of food, check out this family who did it and chronicled the highs and the lows. 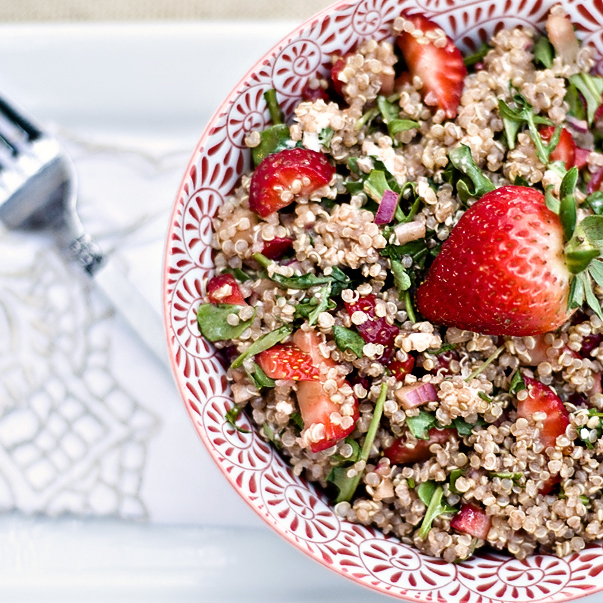 In a bowl add the quinoa, strawberries, goat cheese, basil, arugula and toss combine. In a separate bowl, whisk together the balsamic vinegar, salt, onions and honey. Drizzle the balsamic mixture over the quinoa/strawberry mixture and toss to coat. Serve immediately. I have both FWD to blogs right now, but I hope to have them (at least one of them) FWD to an active store by mid November. Because, apparently, I need MORE things on my plate right now! I love the sharpness of red onions alongside sweet strawberries and creamy goat cheese. I always need a new salad recipe so I’m in…I’ll definitely try this one! Just a suggestion: Don’t see a “print” button on the page. Would love it if you could provide a printable copy. Yes, I can highlight and print, but it probably won’t be formatted correctly. Addendum: How about # of servings, too? Looks like about 4 to me, but would be nice to know for sure. It really depends. It ends up being about 3 cups of salad, so as an entree, it’s more like 2. But for a side, you’d be right, about 4. Thanks for noticing that! I have been meaning to do that. Thanks for the suggestion, I’ll try to do that from now on. 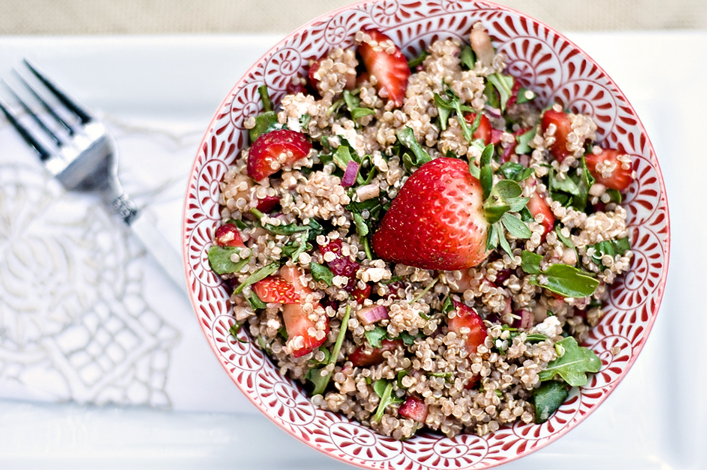 Quinoa, goat cheese, and strawberries, you’ve won me over! I will take a big bowl of this right now please! Funny as I’ve always been all into quinoa lately and will in fact have a delicious quinoa salad on my blog tomorrow.. 🙂 I do find with packaged and processed foods that the less I eat of them the more reluctant I am to go back to using them. I just don’t like the flavors anymore…! 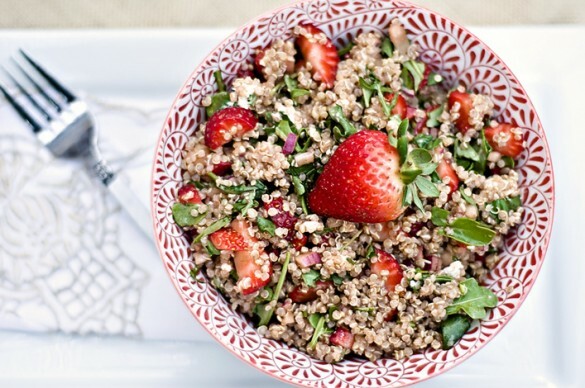 This quinoa salad sounds delicious too! Thank You! I’ve been eating a lot of quinoa salads for lunch these day! I am wondering how this keeps in the refrigerator when already dressed?